Picture a utopian near-future scenario where drones have become everything that enthusiastic journalists like us claim they could be. Above your head, every day, you hear the quiet whine of a drone superhighway - ferrying packages, food and even emergency medical supplies across the city. But one day, something goes wrong. A software glitch causes one drone to abruptly cease functioning in mid-air. The drone nose-dives towards the ground, but your soft body is in the way. The drone collides with you at terminal velocity, and it hurts. But how much? That's what researchers from Virginia Tech are trying to figure out. They've been smashing drones into crash test dummies in a variety of different situations to try and model what happens when a drone inevitably hits a human. They used three commercially available drones, weighing from 1.2 to 11 kilograms, along with a dummy equipped with acceleration and force sensors in its head and neck. 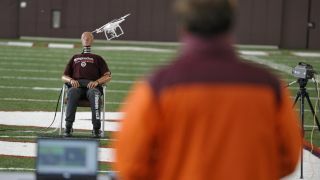 In some tests they flew the drone into the dummy at full force, while in others the drone was dropped onto the dummy's head in different orientations. Those forces were then compared with standard benchmarks that have been established to test whether an object can cause severe or life-threatening injuries. Their results show, as you'd probably expect, that the risk of injury increases with heavier drones. The smallest drone had only a 10 percent risk of causing severe neck injuries, but that rose to 70 percent with the largest one. "There's a wide range of risk," said Steven Rowson, an assistant professor of biomedical engineering and mechanics in the College of Engineering at Virginia Tech. "In some instances it was low, and in some instances it was high, and there are lessons we can take away from that to reduce injury risk in a deliberate way through product design." They also found that the drop tests were more likely to cause severe injuries than when a drone was flown into a person. And injury risk was reduced when an aircraft broke apart on impact, or if a protruding rotor arm, for example, deflected the aircraft away from the body. This suggests that it should be possible to design aircraft features specifically to make severe injuries less likely. The results will be used to decide future regulations on whether drones can be flown over people, and the initial findings suggest that it should be safe for the smallest craft to fly overhead already. "The big question right now is, what is the acceptable level of safety?" said Mark Blanks, the director of the Virginia Tech Mid-Atlantic Aviation Partnership. "How much proof does the FAA need before they say, 'Yes, that's okay'? Once those standards are in place, we're going to see huge expansion in the industry." The full details of the study were published in the journal Annals of Biomedical Engineering.